The look of your home garage door is significant, but if your garage doesn’t open, then it’s all for nothing. 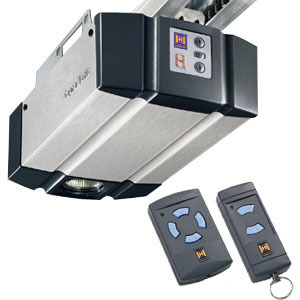 Bel Air Garage Door Company can service and repair all makes and models of garage door openers. We also have an enormous amount of garage door openers that you can pick from. We carry many different brands, including: LiftMaster, Genie, Allstar and more. Don't get stuck outside. Give us a call and let us to help you today! Most house garage door openers function by chain drive or belt drive. The trolley is attached to the door arm and this is linked to the upper portion of the garage door. A diagonal track will direct the trolley from the floor of the doorway to the ceiling. The garage door motor suspends in the overhead section. The door becomes opened or closed each time the trolley passes the track. Bel Air Garage Door Company carries both belt drive and chain drive openers. Chain drive garage door openers use a metal drive chain to consistently operate your garage door. Chain drive models normally cost less than belt drive or screw drive openers, but conventionally, chain drive openers have always been quite noisy during operation. This may be a welcome feature if you like to be aware of everyone arriving or leaving your home, and it doesn't matter if your garage is not attached to your home, chain drive garage door openers use a metal drive chain to operate your garage door. Screw drive garage door openers rotate a helical threaded steel rod to control your garage door. In terms of price and operating noise, screw drive garage door openers are typically considered to be in-between belt drive and chain drive models, and with less moving parts they offer smooth process with virtually zero upkeep. Belt drive garage door openers use a rubber drive belt to move your garage door as unfailingly as any chain drive opener, but much more silently. Belt drive openers usually cost a bit more than chain drive or screw drive openers, but they are unquestionably worth the investment if your garage is attached to your home. Call our Bel Air Garage Door Company professionals today!